The positive change that has occurred in our region—no one can deny it. Things may not yet be at the required level, but there are very clear and concrete signs of progress. But no credit goes to the state: credit belongs to the faith-based and humanitarian organizations that rushed in to support us. However, we still lack the funds to complete the reconstruction of all the homes that were very badly damaged or completely destroyed; we are waiting and hoping that governments, like those of the United Kingdom and Hungary, will step in and help us on this front. Dinner before the Conference “Return to the roots: Christians in the Nineveh Plains” hosted by Aid to this Church in Need starts the next morning – Syriac Catholic Archbishop Yohanna Petros Mouche of Mosul in Iraq, „Casa dei Cavalieri di Rodi“. As for the creation of jobs, there are very few initiatives; we have made many requests to several American, British, French and even Saudi Arabian companies to launch some major projects in the region, so that our people can survive and especially our young people can find work—but we are still waiting. The Iraqi government has made many promises, but few projects have been implemented. Our confidence in the state is low. We are convinced that, offered the right opportunities, many of our people would return to Qaraqosh—if they could live there in peace and stability. The problems will not end as long as greed prevails; when only the strong prevail and the rights of the poor are crushed; as long as the state is still weak and the law is not applied. But our hope is in God and we pray that ISIS will never return. For their safety and overall well-being, Christians depend on the rule of law and the integrity of government—that is what can guarantee safety for us and the Church. There is not one specific and well-known party with plans to attack Christians; however, whoever has ambitions to grab our land loses the sense of citizenship and does not respect the rights of others. Such parties don’t even feel comfortable with our survival and ongoing presence. There are many goodwill visits by official delegations and many good words are spoken—but nothing happens. Good intentions are not enough. On the part of some, there is not sufficient respect for our rights; and Christians do not use violence to defend themselves, but appeal to mutual respect. But if that is not answered in kind, more and more Christians will emigrate. This hurts all of us, who love this land, our history, our civilization and our heritage. Qaraqosh/Bakhdida – The situation in Iraq after Daesh, as it was one year ago in 2017. The Church as a whole—its bishops, pastors and laity—is sparing no effort to claim the rights of its people and to secure an area where we can live in dignity and peace. Church leaders do their best to instill confidence and hope in our people, but without forcing anyone to return, stay or be displaced. That decision each family must make for itself, the decision that guarantees its dignity, its future, especially the future of the children. 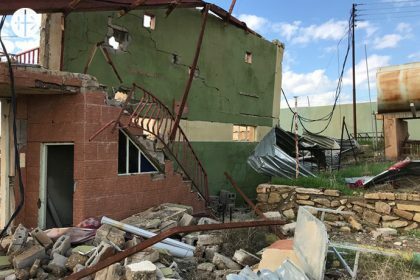 Since 2014, Aid to the Church in Need has been on the forefront of supporting Iraqi Christians with projects totaling more than $40M, including humanitarian aid for faithful who fled to Kurdistan to escape ISIS, the repair and rebuilding of Christian homes on the Nineveh Plains, and, currently, the reconstruction and repair of Church infrastructure in northern Iraq. On 15 November 2017 the Holy Father decided to give ACN part of the proceeds from the auctioning of the Lamborghini Hurricane that had been donated to him by the famous Italian carmaker. 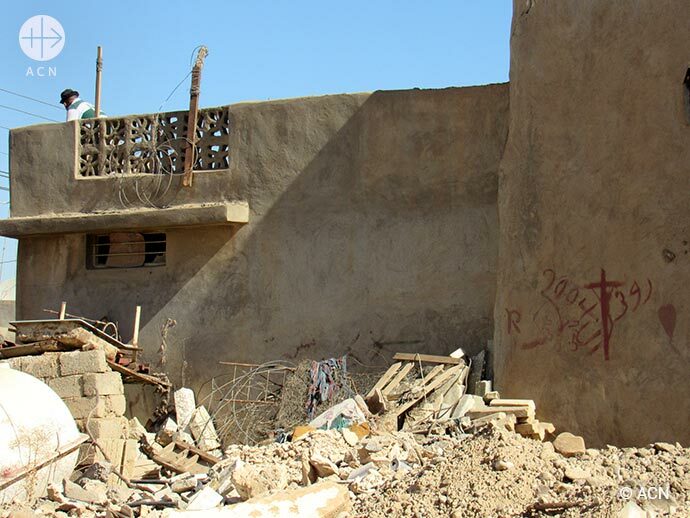 Now ACN will give concrete form to the Pope’s gesture by funding the reconstruction of two buildings of the Syriac Catholic Church, destroyed by the war. They are the nursery school (kindergarten) of Our Lady and the multipurpose centre of the parish of the same name. Both buildings are in the village of Bashiqa, just 30 km from Mosul. The village was badly damaged during the war, but the Christian community has returned, and in large numbers. In fact by now 405 of the 580 homes that were destroyed here have already been rebuilt and around 50% of the Christians, or 1,585 people, have already returned. The two projects funded with the money from the Lamborghini will also benefit the other minorities in the town, since the multipurpose centre, which has capacity for over 1,000 people, will be used for weddings and the religious feasts of all the various different communities. It will be the largest such centre in the area and will be available for use to over 30,000 people of all different faiths and ethnic groups. This intervention, in which the pontifical foundation ACN has played a major role in collaboration with the local Churches, has also found a generous benefactor in the person of the Holy Father. 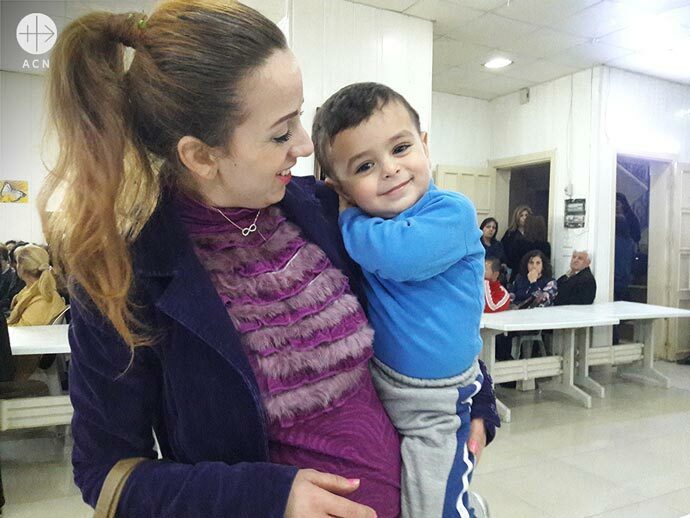 Already back in 2016 Pope Francis gave 100,000 Euros in support of the “Saint Joseph Charity Clinic” in Erbil, which provides free medical assistance. This most recent gift by the Holy Father will be a further help to local Christians, enabling them to live their own faith and offer a future in Iraq to their children. At the same time it is a powerful message and an invitation to peaceful coexistence between the different religions in a region where fundamentalism has sadly done grave damage to interreligious relations. This was the urgent appeal underlying the joint Call for Action signed by the leaders of the three main Christian Churches in the Nineveh Plains region of Iraq and addressed to national governments and other international agencies. “There is still a lot to do” to facilitate the return of Christians “to their respective ancestral communities from which they were expelled during the ISIS invasion of 2014-17.” So runs the statement signed by the senior representatives of the Chaldean Catholic Church, the Syrian Catholic Church and the Syriac Orthodox Church, together with other members of the Niniveh Reconstruction Committee (NRC) which was jointly formed between them for this purpose. The Call for Action gives the following details of the progress of its work since its creation in 2017: Out of the 13,904 houses registered as in need of renovation, fewer than half, 5,746 have now been renovated while a further 84 are currently undergoing renovation. Only 45.68% of the families who were forced to flee the Nineveh Plains region in 2014 – that is to say 9,060 families – have so far returned. The gist of the statement by the NRC is that the process of reconstruction of these homes has slowed down in the last few months of 2018, for lack of financial support: hence the urgency of their appeal. “Another 2,000 families are eager to return, but have no means to do so”, they state. They underline the fact that the return of these Christians to their former homes “is a matter of great urgency, since the window of time for returning safely is closing. If they do not return now to repossess their homes, others will occupy them. 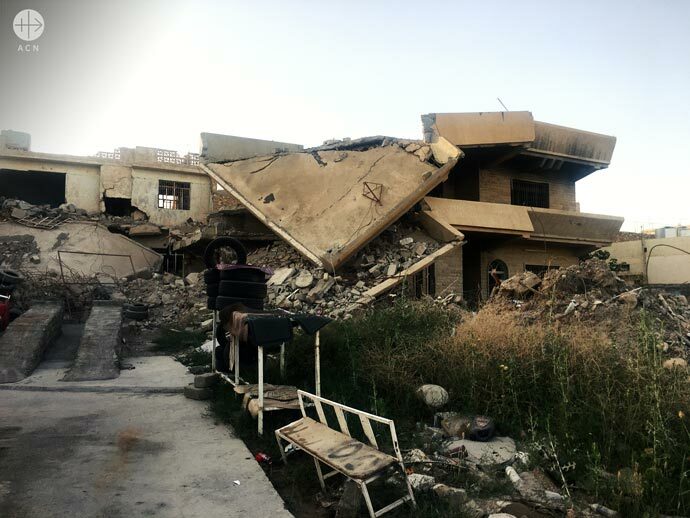 Moreover, the Iraqi government is not inclined to protect empty houses”, the Call to Action concludes. 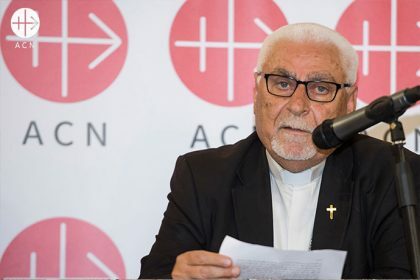 What these religious leaders are calling upon the international community to help for is “not simply to give people back their homes, but rather a more integral project” which aims “also to restore their sense of human dignity”. They emphasize the essential need for coordinated financial aid, especially in the field of education, to address “the critical situation of trauma”, and “for the creation of economic stability by boosting small businesses through the development of micro-projects and loans” in order to prevent these communities falling into poverty and deciding to emigrate as a result. Equally necessary, they insist, are measures for the “legal protection of Christians and other minorities and their fundamental rights, especially of citizenship”. The Church leaders also expressed their appreciation for the important role played by the NRC, a committee established with the support of the international Catholic pastoral charity and pontifical foundation Aid to the Church in Need (ACN International) to jointly oversee the reconstruction programme and the allocation of the financial resources received. Thanks to the NRC, they say, the Christians “instead of being scattered and isolated” have managed to “regain their community life”. They also note that in this region, where “the voice and role of the local Church leaders is stronger than in other regions of Iraq” it is “very important that the various local Churches work closely together, united in diversity”, and add that this ecumenical cooperation has “inspired a great solidarity among the people”. Nonetheless, they point out at the same time that the pressure on the Churches is “enormous” because “people think that the Church can handle it all easily enough”. That is why “we still need a lot of help”, they conclude. Following the liberation of Mosul and the towns and villages of the Nineveh Plains, ACN came up with the idea for a sort of “Marshall plan” – a reconstruction programme for the region, designed to give hope to the uprooted Christian refugees here and encourage them to return to their homes. ACN dedicated around 7 million $ for reconstruction programme oh privat houses. Since September 2018 ACN has also been outlining a programme of financial aid for the reconstruction of the churches and other ecclesiastical structures in the area. 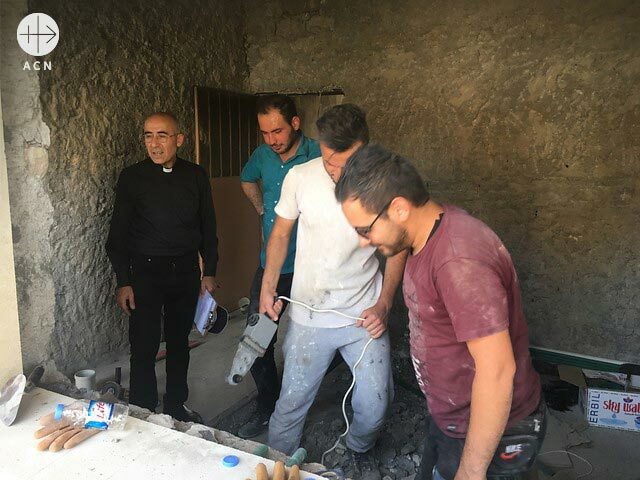 Another priority of ACN’s work is the coordination of initiatives aimed at alerting politicians and international bodies to the need for a long-term development programme for the Christians of the Middle East. And the hard work and commitment of the charity has borne good fruits, among other things in the recent announcement of aid programmes by the German and Austrian governments for the reconstruction of the area. And more recently also by the signing of a new measure on the part of the US government for the allocation of aid to the victims of the genocide in Iraq and Syria. For some Christians in Iraq, the future is just a few weeks old. Baby Timotheus was born in mid-May. “It is my heartfelt wish that my son will be able to grow up in Iraq. God will find a way,” his father Samir hopes. He and his wife Siba are proud parents – and devout Christians. Their baby will be baptised in just a few weeks. The young people – he is 30, she 25 – live in Bartella, a Christian town on the Nineveh plains near Mosul. The majority of its inhabitants are Syriac Orthodox. Their small son lies quietly in the arms of his mother. His parents will later tell him about the difficult times the family went through in the years leading up to his birth. The Islamic State arrived in Bartella in August of 2014. All of the Christians living in the town fled in panic from the Islamic extremists. Their churches and houses were destroyed, damaged, and almost all of them were looted. Aid to the Church in Need (ACN) is making it possible for Christians to return to the places they call home. A large project has been called into being to restore the houses made uninhabitable by IS. This has paved the way for more than 45 per cent of families displaced in 2014 to return to their homes, a total of more than 8700 families as at June 2018. Erbil is overwhelming, amid its semi-desert surroundings and its crushing 44-degree temperatures in the Iraqi summer. At first one is struck by a deceptive air of peace in this, the capital of Kurdistan. There is nothing to suggest that in this part of the world, at this very moment, the destiny of thousands and thousands of people hangs in the balance. You cannot hear it, you cannot see it or sense it, but the Islamist forces are just 25 miles from here; and just a week ago they were at the very gates of the city. Behind the church walls, in the schools and the sports centres, in the shade of half-finished buildings, the reality is hidden: hundreds and hundreds of refugees, even up to 70,000 of them, scattered around 22 reception points. One of the main ones is the Chaldean Catholic cathedral, better known for its Church of Saint Joseph in Ankawa, the Christian quarter of the city. It is estimated that around 670 families have sought refuge here and in the buildings in the immediate vicinity. A makeshift tarpaulin, or the shade of the buildings are all the relief they have to protect themselves against the crushing, implacable heat. Most of them are sitting on the ground, in small family groups, on mattresses or sleeping mats. Others are seated on plastic chairs. Ankawa is one vast waiting room. There are hundreds of faces, but only one story, one witness, one destination that unites them all: they are refugees, condemned to death for being Christians. On 6 August the Kurdish Peshmerga fighters, who were defending the Christian area to the north of Mosul, withdrew. 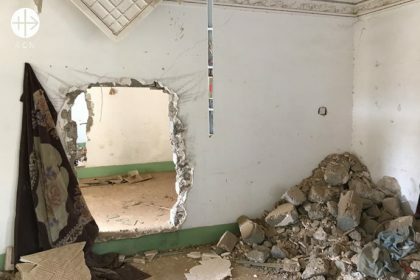 The first bomb fell on the house of the Alyias in Qaraqosh, killing two children, David and Mirat, both cousins, who were playing in the garden, and gravely wounded a third person. 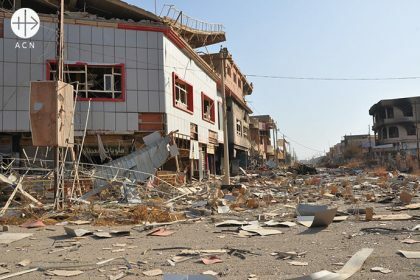 The alarm rapidly spread from there throughout the city: “ISIS is at the gates, the Peshmerga are no longer defending us; take your families and flee!” Qaraqosh was a city of some 50,000, a Christian city for centuries. Everyone left with whatever they could carry. The only ones who remained behind were those who could not move from their houses, the sick and elderly. The people of Qaraqosh were joined by those from other smaller towns in the surrounding area, such as Bartella and Karemlesh. 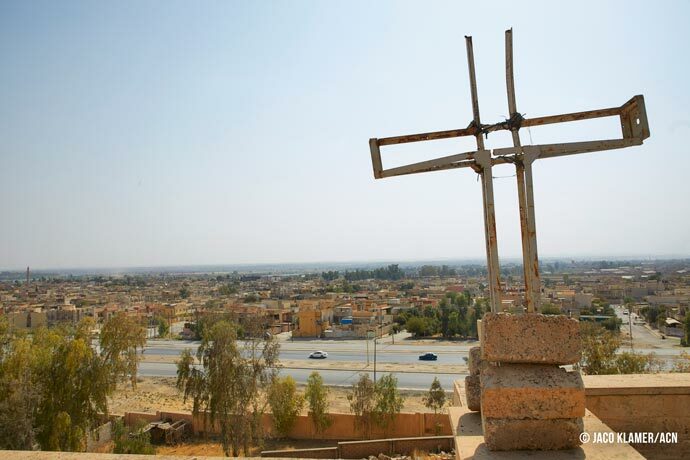 During those days an estimated total of 100,000 Christians left their homes in the region of Niniveh in an exodus of apocalyptic proportions, fleeing in the direction of Duhok, Zahko and Erbil. It is hard to imagine the panic people must feel within in order to leave without looking back, taking nothing with them but the clothes on their backs. But not so hard for those who already know and have lived for years surrounded by, suffocated by and attacked by this islamic findamentalism. Many of them still bear in their very bones the trauma of 10th June, when in the space of a few hours ISIS forces seized Mosul without anyone attempting to defend it. Nobody – neither its politicians, nor its army – moved a finger. In the city of Mosul alone, it is estimated that more than 1000 people have been murdered for their faith since the defeat of Saddam Hussein. Every family has its own tragedy, its own dramatic story; everybody has family members who were murdered, massacred: “This is my brother Salman, he was 43 years old; they shot him three times in the head, five years ago, in Mosul.” Next to the speaker, his mother slowly takes out the photo, holding it between both hands: there is so much pain in this gesture, in those eyes. They fled from Mosul and took refuge in a village close to the ancient monastery of Mar Mattai (Saint Matthew) where they had relatives. They thought they were safe there; hope was reborn for the future; but the advance of the Islamic State forced them to flee again. A few miles from there, Yacoub, another refugee, shows us his leg, crippled and covered with scars from the bomb that exploded in 2008 in a church in Mosul. 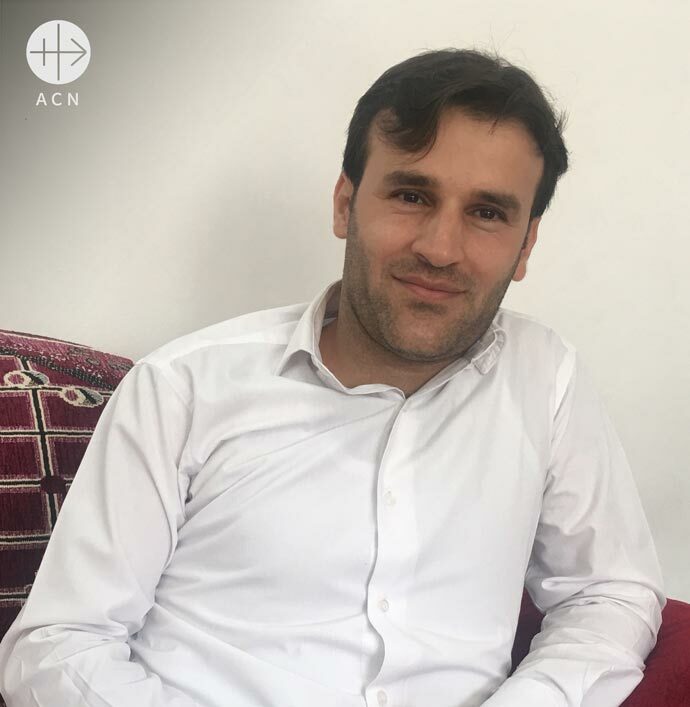 When the jihadists issued their ultimatum to the Christians in Mosul in July, Yacoub fled with his four daughters to Al Qosh, then from there he left in a second exodus two weeks ago to the north of Duhok. He has lost his land, his home, everything he possessed; he has suffered the consequences of the destruction in his own body. But it is not the scars on his leg that trouble him; the great sadness for Yacoub is the future of his four daughters. “Not for us, but for our children”, this is the unspoken appeal of a mother of one of the six Syrian Orthodox families who have found shelter beneath the awning of a tent in the Chaldean community of Mangesh – 16 children altogether. One of the little girls is singing a song in English, surrounded by all the other children: “They all love me, they all love me”. The children, who understand nothing of wars, or hatred, or massacres, who know nothing of what is happening, are not concerned about the future. It is strange to see so many children together, yet not see a single toy, a single doll. Many of the babies are lying directly on the floor, some of them are in little carry cots. Sleiman is carrying his three-year-old daughter in his arms. “What has she done for them to throw her of her land and make her have to live like this?” “Like this” in this case means living eight families to a single room, with mattresses, food and water given them by the Church, in infernal heat and in subhuman conditions. In Erbil there are field tents set up for those who cannot find space in the rooms of a sports centre, with around eight persons in each. It is like an inferno during the day, given the extreme temperatures reaching as high as 48° inside the tent. At night time there is the danger of being bitten by rats and scorpions. “We are saving our lives, the honour of our wives and daughters, and our faith.” These are the three principal reasons for their precipitate flight. And this swift action is what has saved them from suffering the fate of the Yazidi community, who were massacred, raped and enslaved. Nevertheless, for the Christians of Niniveh, Qaraqosh, Al Qosh, Telfek and so many other places, they have been robbed of something more than purely material things, namely, hope. 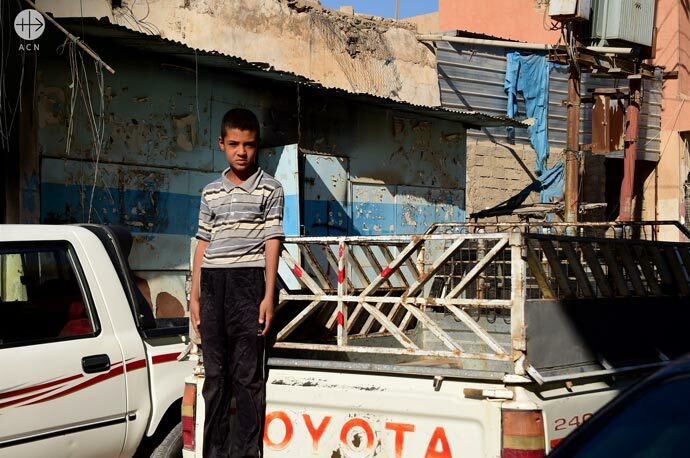 “I cannot go on living here”, laments the father of David, one of the boys killed by the Isis bomb in Qaraqosh. “This country is drenched with blood”. The mother, a young woman clothed completely in mourning, buries her head in her hands, weeping. They have no papers, no passports. They don’t know how to go about requesting a visa, but they keep repeating over and over again that they want to go, they don’t care where, but simply out of this land of suffering. Here there are no specialist staff to help them deal with their trauma and tragedy; they are crowded together with all the other refugees in a school in Ankawa. His brother Adeeb used to work for the dam in Mosul. In broken but clear English he asks, “Why is it that the Muslims who come from outside have their rights recognised in the European countries, while here they treat us like dogs – yet in our case we haven’t even come from outside – this is our country, isn’t it?” Adeeb speaks of the biblical roots of Niniveh, of the land of the Tigris and Euphrates, of the presence of the Christians in Mosul since the second century, of the monastery of Saint Matthew, of the Aramaic language, the maternal language of Christ, of the Syrian and Chaldean Catholics, of the Orthodox Christian communities and of an entire, centuries-old religious and cultural heritage, now wounded by death. Yet this past is also present, real and active. The priests, religious and bishops are all trying to help in whatever way they can. They are everywhere, calling, organising, asking, listening, counselling, praying. What would become of them if the Church were not here? Who would care for them? In Erbil, as in Duhok, where there are another 60,000 or so Christian refugees scattered among the villages and hamlets to the north of the city – some even as far as the frontier with Turkey. The work being done by the Church is extraordinary. Father Samir is a Chaldean Catholic priest in one of these villages to the north of Duhok. He tells of the shock of that first day when, throughout the night until the morning, this innumerable exodus of people continued to arrive, filling the streets, sleeping in their cars, on the pavements. In the parish catechetical centre alone there are now 77 families, Syrian Orthodox, 321 people altogether, of whom 35 are children. Father Samir does not return home before one or two in the morning. Days of work have continued since then, without a minute’s pause. At 10 o’clock at night there is a call on his mobile phone explaining that two Yazidi families are on the roadway with nothing. Father Samir goes out to find them, to bring them matresses and to find them a place to stay in his sister’s house. 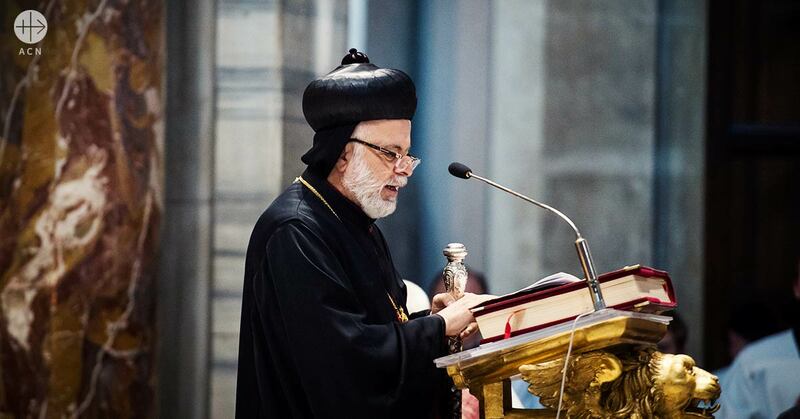 Bishop Emil Nona, the Chaldean Archbishop of Mosul, is one of five bishops who have likewise been expelled and displaced and who have lost their homes. He comes round, accompanied by a priest, bringing packets of foodstuffs, visiting the communities, noting their needs: mattresses, tents, a fridge, medicines. He counsels and encourages them. This is a time when the suffering Church comes face to face with the heroic Church which truly lives the Gospel. It is a Church which needs the support, the prayers and the solidarity of its Christian brothers and sisters throughout the world. 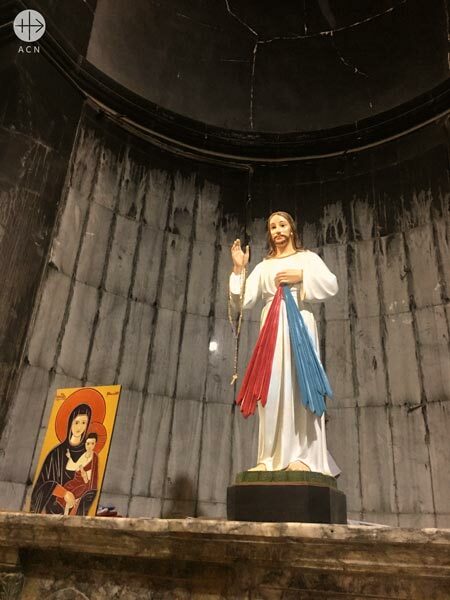 In Erbil, Duhok and Zakho, all over Iraq, the face of suffering is seen on so many faces and in so many tears, and there is little hope left: “Only that of a Christian when the merely human has disappeared”. And everywhere one hears the unanimous cry: “Help us, we cannot continue like this. 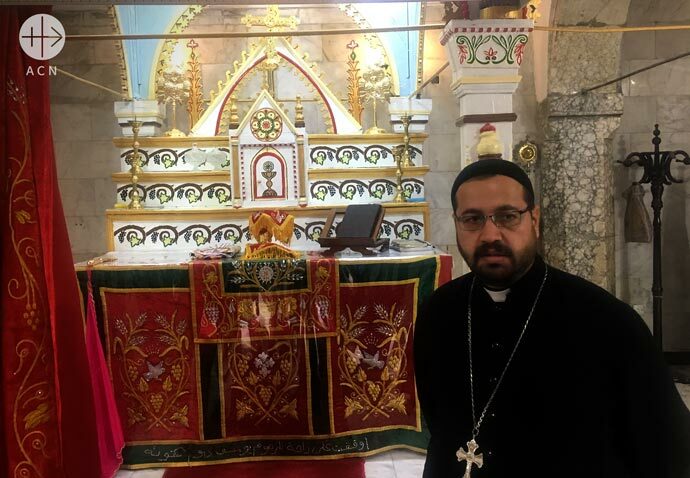 We, the Christians of Iraq are victims of disaster, holding out our hands in the hope that someone will save us from death.” They are hoping that the international community will respond and that it will not be the Church alone who comes to their aid. It is a matter of more than mere Christian charity; it is a matter of salvaging the present, the past and the future of an ancestral culture and religion. And so they are calling for immediate aid to help them get out of these makeshift camps, from those tents, suffocating beneath the sun. But also for lasting help – protection and security, the right to live their faith, which for the Iraqi Christians is their very culture and identity and which they wish to live in their own land – the land that belonged to their fathers and grandfathers. “IS tried to take the monastery. 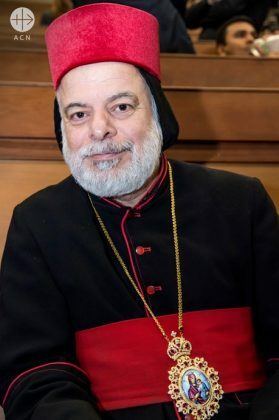 In August of 2014 we were convinced that they would succeed,” Archbishop Timotheos Moussa Al-Shamani, abbot of the Syriac Orthodox Mar Matti Monastery, founded in the 4th century and one of the oldest in the world. The monks fled, but quickly returned after they had got over the initial shock. Hundreds of Christian refugees lived with them for months – just a few kilometres in a direct line from their worst enemies. “IS never managed to take our monastery. God was with us.” The trenches dug by IS fighters at the foot of the mountain are still there. This is where the henchmen and the Peshmerga, the military forces of Iraqi Kurdistan, faced off for more than two years. The IS fighters frequently fired mortar shells at the monastery. When the weather was poor, they regularly tried to take the monastery, but were prevented from succeeding through bombing by the US-led coalition. Since late 2016, the villages and towns have been freed from IS, one after the other. The Nineveh plains have also been liberated. The monastery is no longer in danger. But how are the faithful doing? “The Shabak want our land,” Abuna Jakob tersely says. “That is the next problem.” The Syriac Orthodox village priest of Bartella is a nephew of Archbishop Moussa. IS was the problem in the past. “I was the last person to leave in August of 2014, and the first person to return.” The village cleric recalls how tears came to his eyes when he first heard the bells ring out again. Abuna Jakob leads us through his freshly renovated parish church. Everything gleams in radiant white and gold. Only the charred chapel in a side aisle is a reminder of the jihadists. “It was desecrated by IS. We are leaving it as a warning.” The village was liberated from IS in October of 2016. But now there is the problem of the Shabak. In 1980, there were only two Shabak families in the village, today their numbers exceed 20 per cent. And the trend is upward. At the root of this demographic microconflict is the high birth rate of the Shabak – and the fact that more Christians than ever are ready to sell their land for a cheap price. The Church is trying to keep its members from doing so. But those who have already used up all of their savings to flee, who are already living outside the country or who want to emigrate to Australia often have no other choice. The love for one’s country is something one has to be able to afford. Chapel in St Mary’s church in Qaraqosh. The church has been damaged by ISIS. Now prayer has returned. “I will never sell my land to the Shabak,” Ibrahim says resolutely. The 63-year-old farmer is dressed in the floor-length thawb, the traditional garment worn by men. There is not a trace of grey in the immaculate black of his impressive moustache and hair. He grows grain, chick peas and sunflowers on the land owned by his family. He has seven children – not one of whom has remained in Iraq. “They are in Turkey and in Europe. I keep telling them that they should return, but they don’t want to because there are no jobs here and no safety.” Ibrahim harbours no great illusions in this regard. “In twenty years, there may not be Christians left.” And yet, the exact opposite seems to be true at the moment. In every nook and corner, things are feverishly being built and hammered, the damage left behind by IS is being fixed. In the evenings, loud singing accompanies the Arab music played in the village restaurant, making it a struggle to hold a conversation; kebab and chicken sizzle on the grill, and young people get together, all in high spirits. Almost five thousand Christians have returned – and things have returned to the way they used to be. Reconstruction is only possible because Christian organisations – with Aid to the Church in Need (ACN) leading the way – are contributing millions in donations. The Iraqi state only exists here on the flag and on passports. “The government has no money and other priorities. No one shows their face here. We would be lost without the help of our fellow Christians in the West,” says Father Jahola expressing his gratitude. Aimery de Vérac is happy to hear that. The Frenchman works as a go-between for ACN and has therefore been living in Iraq for the last few years. “Helping the people makes me very happy. They love their homeland. We are committed to maximum transparency in our work. 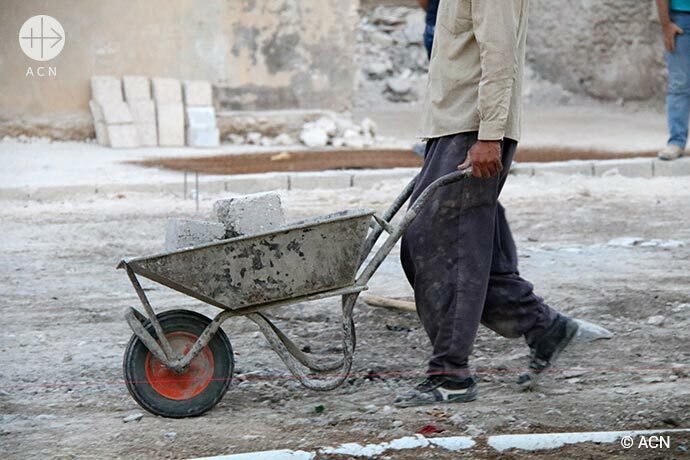 We can account for every dollar we spend.” According to the Frenchman, more than 8 700 families have in the meantime returned to the Nineveh plains and more than 4 300 homes have been made habitable again. 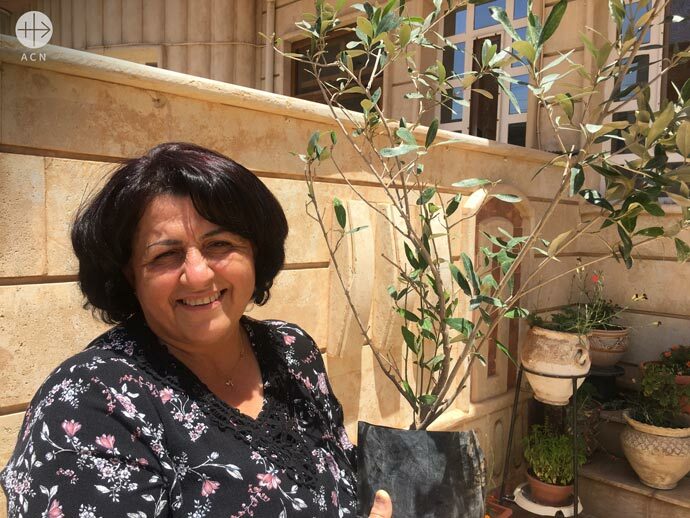 Each time a home has been finished, ACN gives the owners an olive tree. The biblical plant is intended to be a symbol of hope and the future. 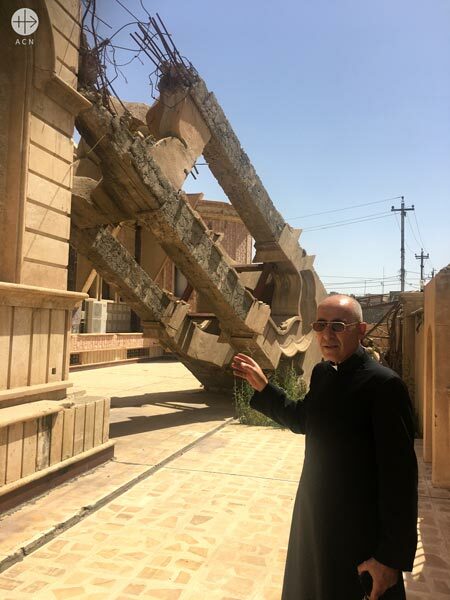 Syriac Catholic parish priest Father Georges Jahola in front of the bell tower ISIS destroyed.